the precinct election commissions (hereinafter — PECs) are the key actor of the election process. It is the PECs that directly organize and conduct early voting, voting on Election Day, and home voting, counting of the votes and tabulation at the polling stations. as in the previous local elections, one of the essential legally-enshrined obstacles to the nomination of representatives of political parties and public associations to the PECs is a requirement to possess registered local branches (at the regional, city, district, and city district levels). there were no significant obstacles to applying for the nomination of representatives to the PECs. all representatives of the campaign “Human Rights Defenders For Free Elections” had the opportunity to attend meetings of the authorities charged with the formation of the PECs, which is a positive development compared to the local elections of 2014, when in 52.3% of the cases the campaign's representatives were denied this right. Not all stakeholders, including representatives of the campaign “Human Rights Defenders For Free Elections”, had the opportunity to familiarize themselves with the nomination documents (minutes of the meetings of local branches of political parties, public associations, labor collectives, citizens’ applications). In 72.4% of the cases, representatives of bodies that formed the PECs denied access to this documentation, which prevents the observers from properly assessing the compliance of the selection procedures with the provisions of electoral legislation. the absence in the Electoral Code of a requirement for mandatory indication of the place of employment by candidates selected as PEC members does not allow to fully evaluate the composition of the formed PECs. At the same time, the Electoral Code prohibits certain categories of persons (judges, prosecutors, heads of local authorities) to be elected as PEC members. It also contains a quantitative restriction on the number of civil servants on the commissions. in 65.5% of the cases, the meetings of bodies that formed the PECs did not involve any discussion of the professional and personal qualities of persons nominated to the commissions. In cases where the number of applicants exceeds the number of seats on the commissions, a separate vote was held, but there was no discussion of each candidate. in 72, 4% of the cases, the campaign's representatives reported that a pre-arranged list of candidates to the commissions was put on a vote. This indicates that in most cases the formation of the PECs was of a formal nature and the composition of the commissions had been pre-determined by the local executive authorities. the role of political parties in the formation of the PECs remains traditionally low. Of the 15 registered political parties in the country, 11 parties nominated their representatives to the PECs (a total of 3,932 persons, or 5.89% of the total number of nominations). Of them, four opposition parties nominated 237 persons (0.37% of the total number of nominations, or 6% of the total amount nominated by all the political parties). the majority of persons who applied for PEC membership were representatives of the four major pro-government associations (BRSM, Belaya Rus, Women's Union, and Veterans’ Union) and the Federation of Trade Unions. In total, they nominated 24,725 persons (37.05% of all nominations). the results of the formation of the PECs indicate a persistent discriminatory attitude towards members of opposition parties and movements. In particular, only 26 persons (11% of the number of nominations) from the opposition parties were included in the PECs. 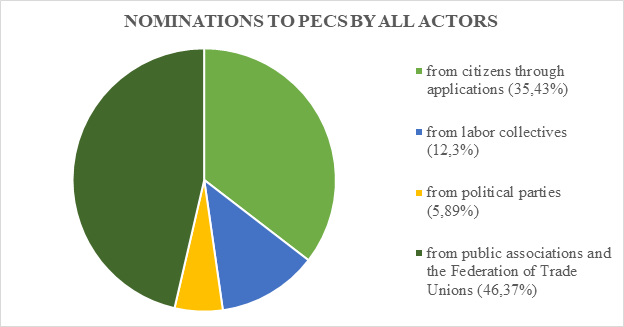 For example, 30,091 persons nominated by the five pro-government associations were included in the PECS (97% of all their nominations); 95.9% of nominations by the pro-government political parties were approved as PEC members. the formation of the PECs during the current local elections was held in an atmosphere of greater transparency and openness than in the previous local elections of 2014, but the overall results and the procedures of formation of the PECs did not differ significantly from previous elections. The introduction by the Central Election Commission of requirement to discuss the professional and personal qualities of the candidates nominated to the election commissions failed to contribute to greater political pluralism in the PECs.